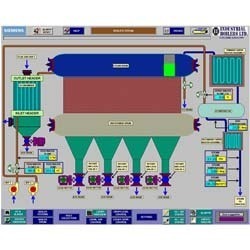 PLC HMI, PLC SCADA or DCS, with complete Instrumentation. VRL's has years of expertise in Automation, VDFs, Electrification related to waste heat recovery boilers, biomass power plant and many more. Distributed Control System with hot redundancy for following Boiler Controls. Five element drum level control. De-aerator level & pressure control. Leveraging on our prosperous industry expertise, we provide Boiler Automation Services. These services are accomplished using the advanced techniques. In addition, our provided service is rendered in diverse terms and forms that meet on customer’s demand. Moreover, we render this service at nominal costs. - Capacity / Performance enhancement. - Proposal to convert old "Grease Lubricating bearing system" of Travelling Grate shaft to trouble free "Self Lubricating Type Carbon bearing bush system". - Proposal to convert Dumping/ Travelling Grate boilers to Travelling/ FBC boilers. Application: Flying shear, rottery cutter, cut to length, weigh feeder, belt feeder, bagging, batching, process . CORONET provides PLC automation devices to adjust the heat produced in the boiler in relation to its demand thus ensuing maximum efficiency resulting in phenomanal savings on fuel costs. The time-program can be predefined by the user or set in accordance with changes of the outside temperature. - PAC Based sequential and industrial operation of FD Fan, ID fan, FW pump, Soot Blowers in an interlocked Fashion. Super Steam Boiler Engineers Pvt. Ltd.
Over the years, SMEC has been attending the Complicated proprietary Boiler Control Systems from few boiler makers for various owners, mostly in emergency situations even upto where vessel expelled from berth etc because of boiler non performance, as they couldn’t fire the boilers even in emergency mode. We are providing main incomer panels , power factor panels, MCC panel for starter, PLC panels, scada designing, PLC , SCADA programming & commissioning for boiler automation. D&T Automation Solution developing trading of Industrial Automation solution in Delhi NCR.